when you give big cats a touch of the nip? It turns out that kitties will be kitties whatever their size, wild or domestic. Just like their diminutive domestic cousins, the big cats go through the same four behaviors when they imbibe: 1) sniffing; 2) licking or chewing, often with the head shaking; 3) rubbing with the cheeks and chin; and 4) rolling belly-up. 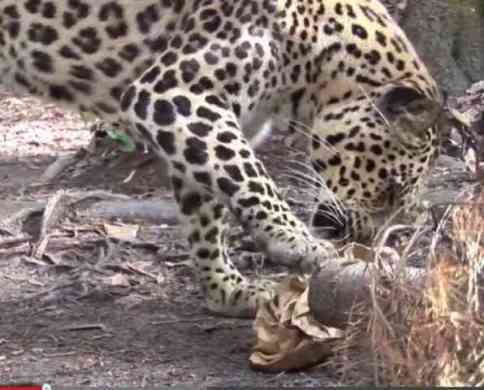 Leopard Getting High (You Tube Image)Catnip is a perennial herb in the mint family. It also goes by the name catswort or catmint. It is native to Europe and areas of Asia. It has become widely naturalized in many areas. Where I live it is an aggressive weed. My neighbor, an herbalist, lets it grow in her garden. In early spring I have seen my cat sitting in the area of her garden where it grows wild. She was staring at the ground willing it to grow. About one-thirds of all domestic felines have no reaction to catnip at all. Some have just partial responses. These responses appear to be hereditary. There is something heart-warming about watching a cat that could rip you to shreds acting just like your little tabby rolling on the living room floor. Domestic cats also get a kick out of the herb Valerian because it has some of the same chemical qualities. What I haven't been able to discover is why my cat also goes crazy for wintergreen (birch) essential oil. Since it is toxic I keep it safely in a drawer she cannot open. So, do big cats also purr? Some do, some don'. The bigger they are the less likely they are to purr.